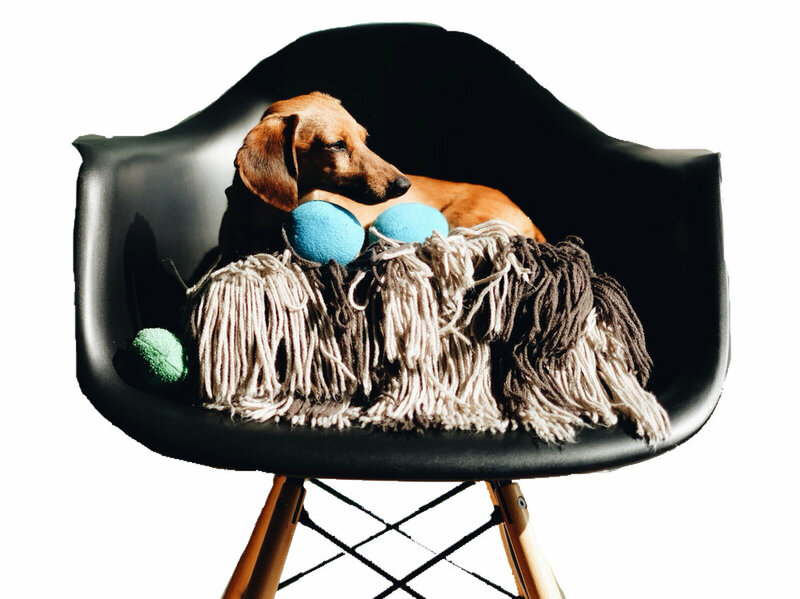 If it feels like I’ve been a little radio silent or off in my world, it’s because I have. It’s called cookbook land, and I’ve been living, breathing, and subsequently eating all things Hawai‘i. And I’m loving the whole process, but it’s a touch all-consuming, so it’s nice to take a break here and there to enjoy what’s happening out in the rest of the world outside of my local Hawai‘i food bubble. It’s crazy because here we are in October and it feels like I was just remarking that I couldn’t believe it’s September! Where is this year going? Can you slow down a little for me 2017? I need all the days I can get to work on my manuscript!! A few people have asked, what do you do when you’re not working on your book because it seems like we never see or hear from you anymore. Well, to be honest, I don’t have a lot of downtime from the book, but when I do, I try to get out and explore the world around me as much as possible. And that means embracing the seasons, visiting the farmers markets, and going out to eat all the foods I’m not making for the book. Lately, I have been really into sweet and savory combos. I've been living for all the fall produce, especially pears, figs, and apples, and have basically taken it upon myself to use them in all the things. I love pairing them with classic dishes that I already love, like salads, sandwiches, and pasta dishes! If I’m going to be making anything that’s not book related, it’s got to be quick and easy and super satisfying. And let me tell you, that magical combination of sweet and savory makes for a pretty dreamy and very pleasing dish, in my opinion. Take for instance a brie and prosciutto sandwich—that’s a thing right? Well, that brie and prosciutto sandwich is epic, but when you add fresh figs, apples, or pears (they all work, I’ve tried), it is next level good. Add a drizzle of balsamic vinegar and it’s next next level, like the ultimate level. I highly recommend you give it a go. But enough about that because I want to tell you about this pasta dish. Gahh, it’s good—it’s quick, easy, and it checks all the boxes for me. 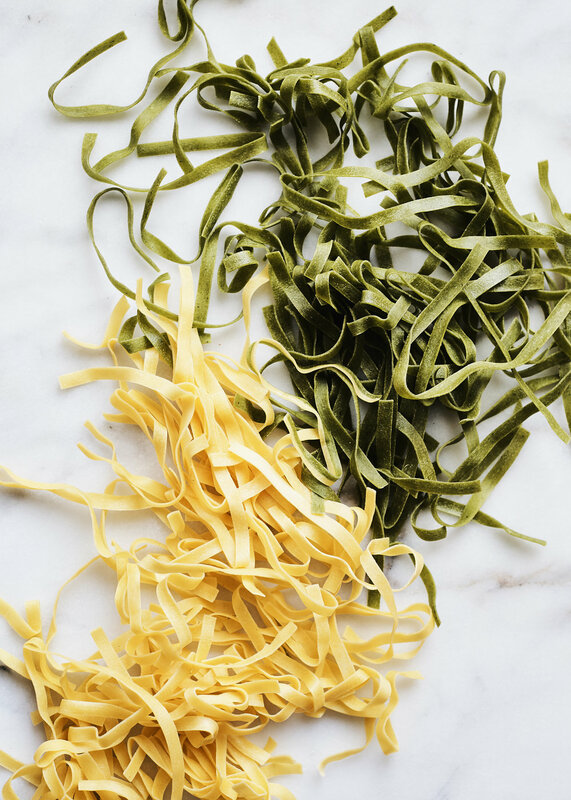 It starts with Giovanni Rana Tagliatelle, which thanks to their perfect blend of flour, has the ultimate al-dente bite. The texture is a little bit rough, meaning the pasta cooks quickly, holds the sauce well and doesn’t stick together. As you know I’m a huge fan of their filled pastas, and their flat pastas are also amazing. Their tagliatelle cooks in two minutes. TWO. MINUTES!! That pasta is tossed with a radicchio and blue cheese sauce that in total probably takes 10 minutes max to make. It’s super creamy and silky smooth without being over the top. 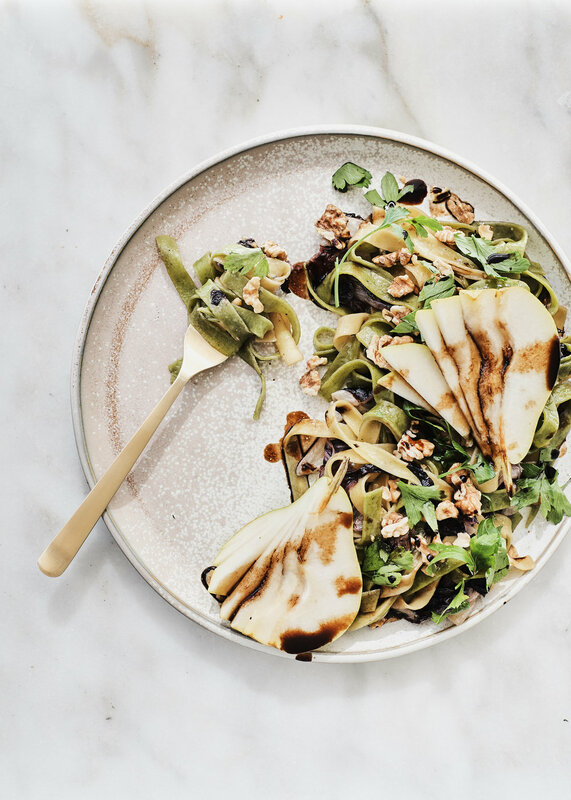 Tossed with some fresh Italian parsley and toasted walnuts, this dish finished off with some fresh, sweet pear slices and a drizzle of aged balsamic vinegar. When I went to Verona with Giovanni Rana earlier this year, I was impressed by the quality of all their ingredients and the way that they use only high-quality ingredients like carefully sourced vegetables, golden-yolked eggs, and their perfect flour blends to create the best products. When I came back, I took that philosophy to heart and started applying it to my everyday cooking. 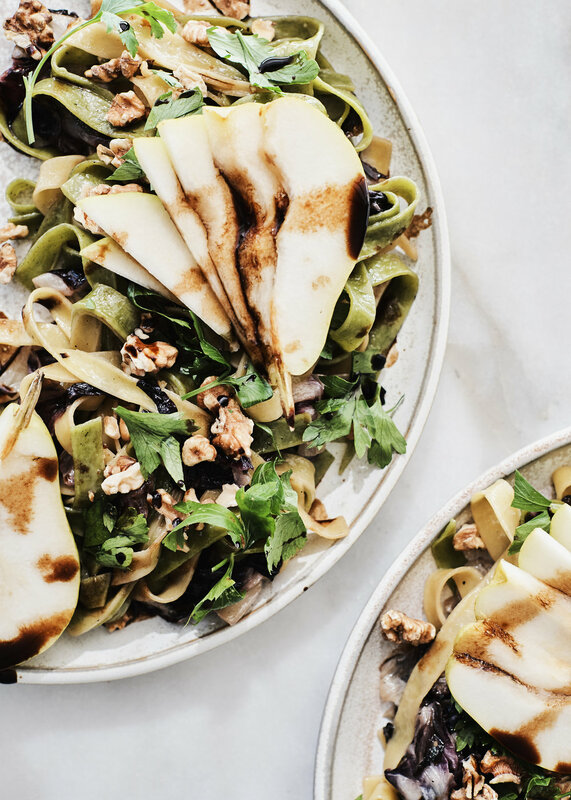 This pear and walnut tagliatelle with radicchio and blue cheese is a reflection of that. I hope it makes your weeknight (or weekend) dinner as epic as it did mine. Bring 6 quarts of water to a boil in a large pot. Add a pinch of salt and cook the Giovanni Rana Tagliatelle for 2 minutes, stirring it occasionally to prevent the noodles from sticking together. Drain the water, reserving 1/2 a cup for use later. While the water is coming to a boil, heat the olive oil in a large pan over medium heat until the oil is shiny and shimmering. Add the radicchio and cook until it begins to wilt and starts to brown, stirring occasionally, around 4 to 6 minutes. Season with salt and pepper to taste. Add the blue cheese and cook for around 2 minutes or until the cheese is melted. Add 1/4 cup of the reserved pasta water and cook until it starts to bubble and reduce. Add the pasta into the pan and toss to coat and incorporate. Add the walnuts and more pasta water if the sauce looks too thick. Serve immediately, topping with the parsley, pear slices, and a drizzle of balsamic vinegar. This post was sponsored by Giovanni Rana. I honestly love all they’re doing and use their pastas all the time!